We are proud to be Oklahoma’s #1 source for HALOCOUTURE® hair extensions. If you are wanting to extend your length, add volume or enhance your color, we’ve got you covered with HALOCOUTURE® natural hair extensions. Designed with comfort in mind, the easy Halo application will transform your hair in a matter of seconds. This innovative extension is non-damaging and virtually undetectable. With more than 30 shades of color to choose from (including Balayage and rooted pieces), the entire line is made of 100% Remy Human Hair, allowing for coloring, styling, and washing extensions just as natural hair. Schedule a free 15-min. consultation HERE or call 918-760-3708 to get in today! Cost: $300+ Prices are based on desired style/texture/length. See Price Guide. Turn-Around-Time: Your Halo will be ready to go 24-48 hours after you order. *Need it faster? We can overnight your halo for a small fee. Cut-In: We suggest a cut-in appointment after your Halo arrives (cost of a normal haircut) to ensure a seamless look of perfection. The most popular hair color trend today is now available from HALOCOUTURE® with the New Balayage Collection that includes blends from our 7 best selling colors. Balayage is available in all lengths of the Original HALO® and the Layered HALO®. Now you can maximize length, add volume, and enhance color! 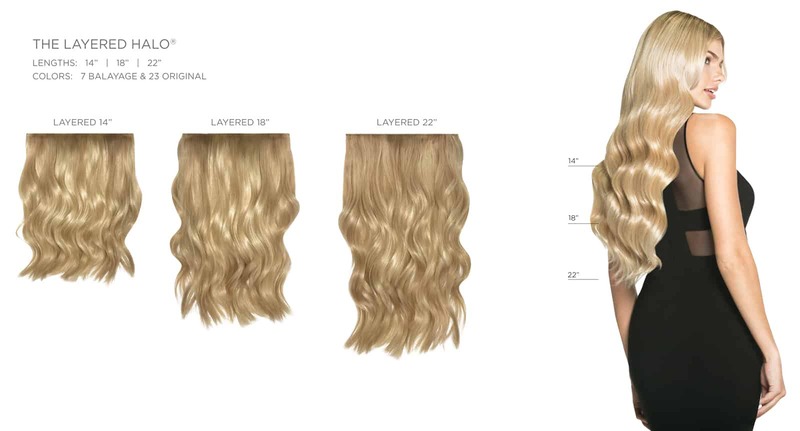 HALOCOUTURE® has the perfect Extensions for everyone. 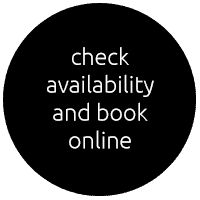 Remy hair is the finest quality human hair available on the market today. Remy Hair refers to human hair that retains the cuticle layer, the outer most part of the hair strand, flowing in the same direction, flowing the way hair does naturally. The delicate process which maintains the cuticle in hair wefts is the key advantage of Remy hair keeping it soft and silky, smooth and shiny, long-lasting and tangle-free. Simply put, Remy Hair is gorgeous hair! And we have selected the very best among the Remy hair choices. Our hair is the Rolls Royce of hair. 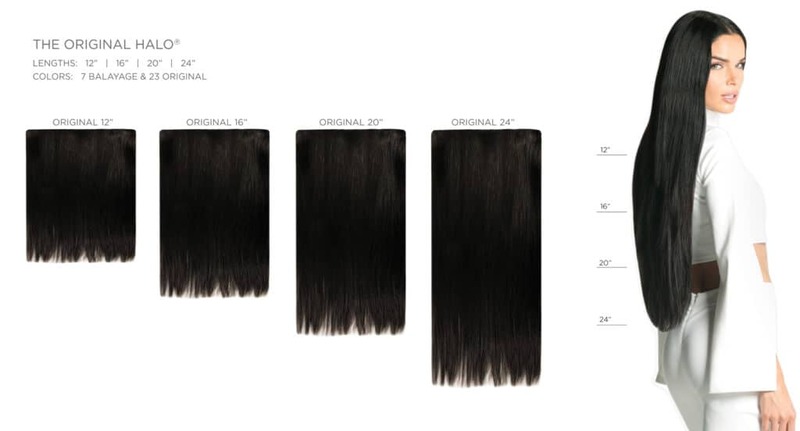 Due to Human Hair industry standards the HALO® Extension is a Final Sale product with no refunds or returns. We cannot speak for all extension products on the market, but we can confidently say that HALOCOUTURE® Extensions will NOT damage your hair. In fact, there is no complicated and lengthy process, no weaving, no clips, no glue. You won’t need to be planted in a chair for 7 hours. HaloCouture Extensions easily attaches with a miracle wire that is quickly customized to fit your head in just a few short minutes. The great news is that there is no sacrifice in quality or quantity. Now you have a real alternative that is truly quick and easy with the same satisfying results. You get a full, gorgeous head of hair in one HALO® Extension without any of the concerns of damage to your natural hair. Can I perm my HALOCOUTURE® Extensions? We do not recommend perming your HALO® Extension. Perms can be harsh and this could possible dry out or ruin the HALO® Extension. The HALO® Extension is 100% Remy Human Hair, but because it is not getting the same natural nutrients as your natural hair, perming chemicals may not react well with the HALO® Extension or be as forgiving as your natural hair. How long will my HALOCOUTURE® last? Depending on how often the piece is being worn as well as the care given to the HALOCOUTURE® Extensions, it should be lasting 9 months or longer. Being that this is a Human Hair product there is not a guaranteed time frame that the HALO® Extension will last. This is an estimate based on the best quality care being given to the HALO® Extension. I’ve never worn Extensions. Aren’t Extensions expensive and require a long term maintenance commitment? You can beautifully transform your look with the rich fullness, silky texture and stylish design you have always dreamed about. Many other extension products require you to initially sit in a chair for 7 hours and require a substantial investment, only to have to return every 4 months for maintenance which is also costly. 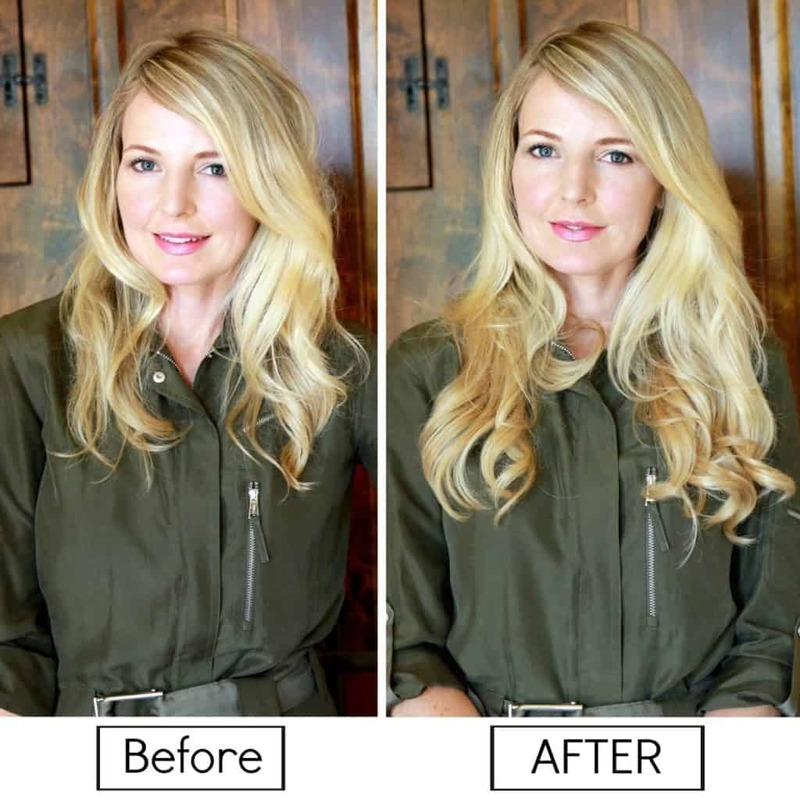 With HALOCOUTURE® Extensions, you visit the Stylist to get color matched, spend 10 minutes getting fitted and another 30 minutes to have the stylist blend your HALOCOUTURE® Extensions and you are set! No costly maintenance fees! And you can wear your extensions over and over! How will my HALOCOUTURE® Extensions stay on without clips, or bindings? Please refer to our Instructional Video: “How To Fit Your Extensions”. 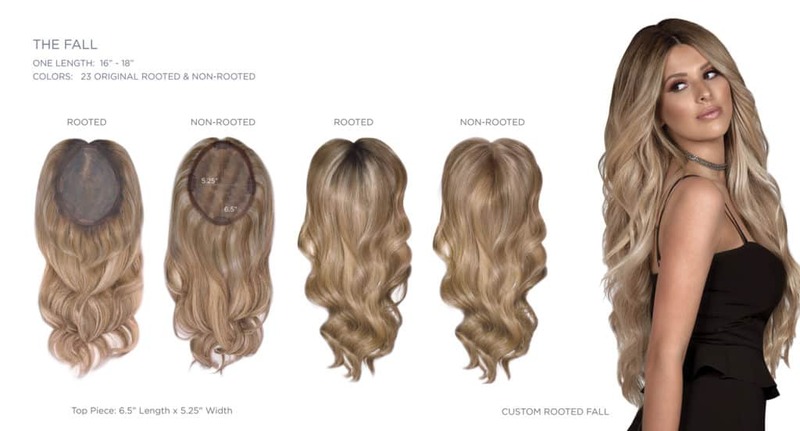 Your HALOCOUTURE® Extensions is custom fit and sits on top of your head like a HALO®. The miracle wire sits about an inch to three inches behind your hairline and the back of the hair extensions slides down just under the occipital bone. The perfect fit will be snug and comfortable and will ensure no movement of the HALO® Extension. After you gently pull your hair out and over to cover your entire HALO® Extension, including the miracle wire, the weight of your hair lying on top of the HALO® Extension, will keep it secure and in place. You will be able to shake your head without your extensions coming off. Can I wear a HALOCOUTURE® if I already have Extensions? Yes, you can certainly wear multiple extensions at the same time. Keep in mind, each of our extensions have over 100 grams of 100% Remy human hair, which is the equivalent of a full head of hair. That said, you can enjoy double or triple the luxurious volume that you would achieve with multiple extensions if you so desire. Please work with one of our Authorized Salons to get fitted and have them expertly blend the extensions perfectly. 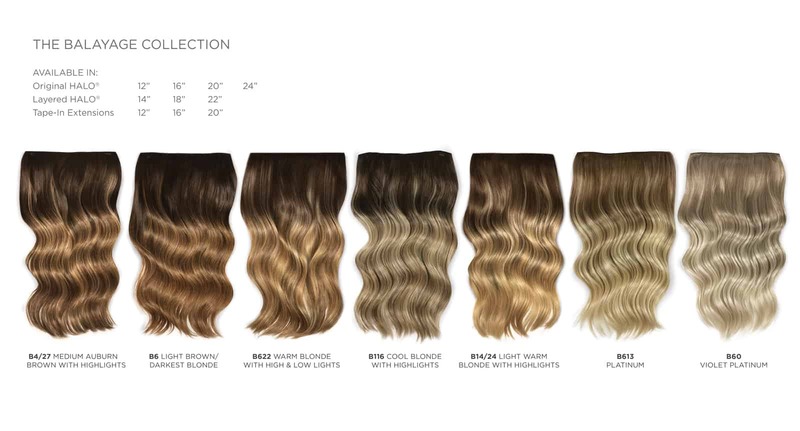 Can I color my HALOCOUTURE® Extensions? Yes, you can deposit color. Because HALOCOUTURE® Extensions are 100% Remy human hair, you or your stylist may color as you would your own hair. However, since some color brands may work differently, we recommend you test the color with a few strands in a discrete area of the HALO® Extension first. Note, some colorists have found that washing and air-drying the HALOCOUTURE® extensions prior to coloring helps the hair take the color more effectively. We do not recommend stripping the HALO® Extension of color (bleach or lightening). We can not guarantee the outcome of this and it could dry out the HALO® Extension or possibly ruin it. PRISM Tape-In Extensions are not color safe (they are made with 70% Remy human hair and 30% synthetic hair) we do not recommend coloring any of the PRISM Tapes. Can I style & blend my Extensions? Yes, because HALOCOUTURE® Extensions are 100% Remy human hair, you or your stylist may style as you would your own hair. For stylist’s: if your client has long layers you may want to texturize and layer the HALO® Extension while your client is wearing it. If your client has a blunt hairstyle, you may need to texturize and layer your client’s hair and then texturize and layer the HALO® Extension while it’s on your client’s head. Because your HaloCouture Extensions are so simple to remove and put back on, we recommend that you remove your HALO® Extension and hang it up prior to going to sleep to best preserve its custom style. Then you can quickly and easily wear your HALO® Extension again upon waking. In the event you may fall asleep while wearing your HALO® Extension, it will not harm you or your HALOCOUTURE® extensions. It is not recommended to swim in your HALOCOUTURE® Extensions primarily because it does not use weaving, clips or glue to directly attach to your existing hair. HALOCOUTURE®Extensions are designed to fit snugly on your head and be held in place securely with the aid of your existing hair. If you submerge your head in water, the extensions may float up off your head similar to the way it’s designed to be removed. What if my item is back-ordered? 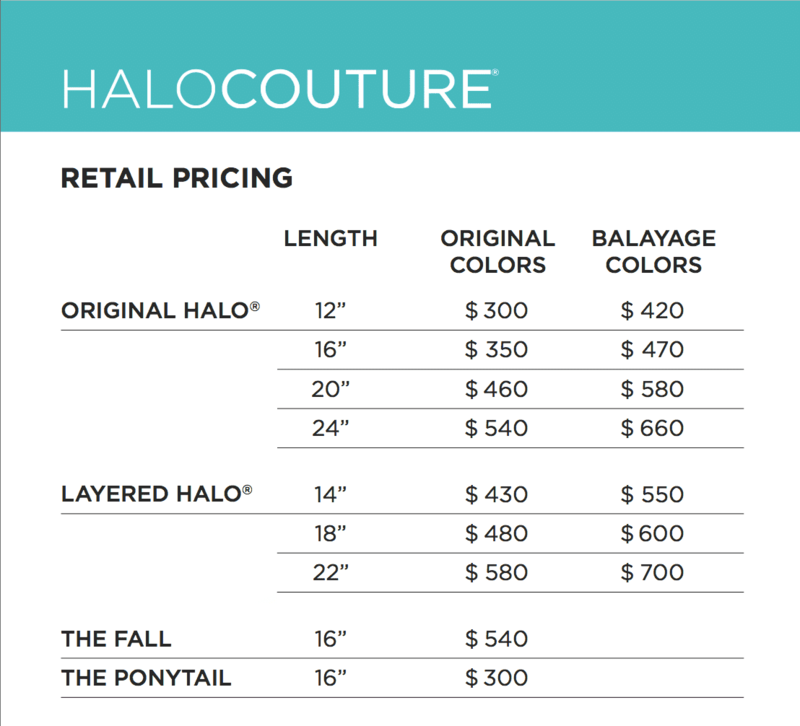 Occasionally, HALOCOUTURE® Extensions may be out of stock for immediate processing and shipping. Any item on backorder has a limited time to be cancelled from your order at no charge as long as processing has not started on that item. Once processing has started on the item, then our Return Policy would apply.